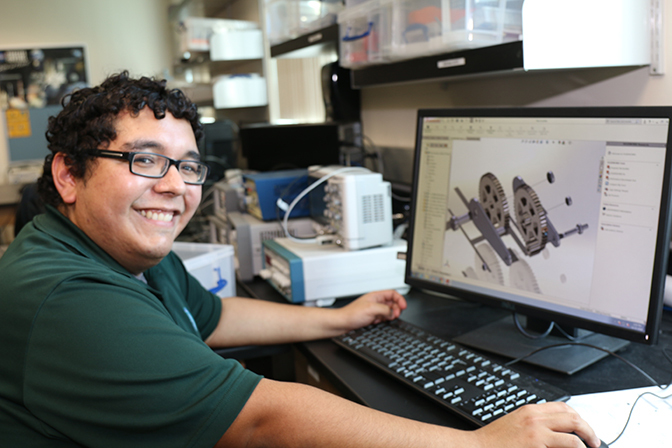 Eduardo Gilces works on a CAD drawing of a gearbox, a final group project in the Engineering Technology program on the Palm Beach Gardens campus. Back then he was paying his bills with a job in the produce department of a local Publix. While he spent his days stocking and cutting up fruits and vegetables, his ambitions lay elsewhere. As a teenager, Gilces, who is good in math, would play around with his civil engineer father’s computer-aided design software. He wanted to pursue an engineering degree after he graduated from PBSC with an A.A. degree in 2014, but universities had a slew of prerequisites for their engineering programs, and Gilces found himself overwhelmed. That is until his friend and Publix co-worker, Thomas Garza, opened a door. 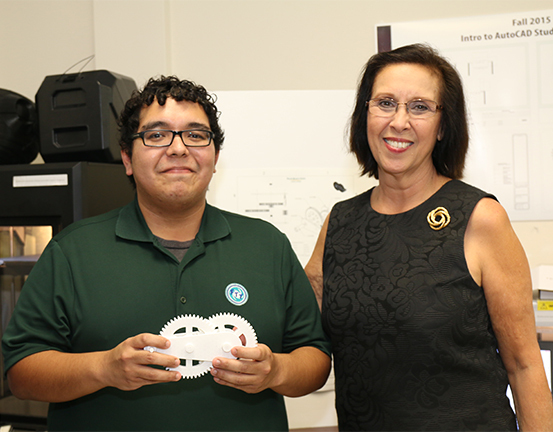 Garza had enrolled in a related PBSC program, Electrical Power Technology, and invited Gilces to come to one of the program’s events. There Gilces met Professor Oleg Andric, chair of the EPT program, who instead encouraged him to consider Engineering Technology, a program closer to his interests. Soon everything came together for Gilces. Eduardo Gilces and Professor Eva Suarez in the lab shared by the Engineering Technology and Electrical Power Technology programs. Gilces holds a model of the gearbox group project, made with one of the lab’s 3-D printers. Projects are judged by an industry panel. He’s also getting good at it. Recently, he helped save a client from a costly manufacturing error. Gilces will continue at the company after his graduation on Dec. 19 and sees a bright future there. Gilces, 26, grew up in West Palm Beach and graduated from Forest Hill High School. Looking far into the future, he speculates that he may one day teach at PBSC, like his professor and work colleague Eva Suarez, who is chair of the Engineering Technology program and holds a part-time position at FTT as a program engineer. The Engineering Technology and Electrical Power Technology programs are hands-on, practical and closely related to industry, which allows students to see the connections and apply what they are learning. All students do internships, many of which lead to jobs. Gilces’ case was exceptional—FTT hired him on the spot. Garza, who graduated from the EPT program in August, also transitioned successfully from an internship to a full-time position at Sikorsky Aircraft Corporation, where he is an instrumentation technician in its Development Flight Center. “The program truly changed my life. I’m in places I never imagined myself to be, and I know it’s only going to keep getting better for Eduardo, too,” Garza said. Another fabulous PBSC success story. Congratulations Eduardo Gilces. Proud of you! Congratulations to Eduardo & Thomas! Congratulations to the students and graduates of the Engineering programs at PBSC! Led by the amazing Oleg Andric and his staff, these students are filling the gap of much needed talent to fill the jobs being vacated by our baby boomers…Keep up the great work PBSC! Congratulations to Eduardo, Thomas, and all the students of the Engineering and Electrical Power Technology Programs. And kudos to the dedicated, talented, and caring Professors, Eva Suarez and Oleg Andric, who run the two programs and go above and beyond to assist PBSC students succeed in making their professional dreams come true!